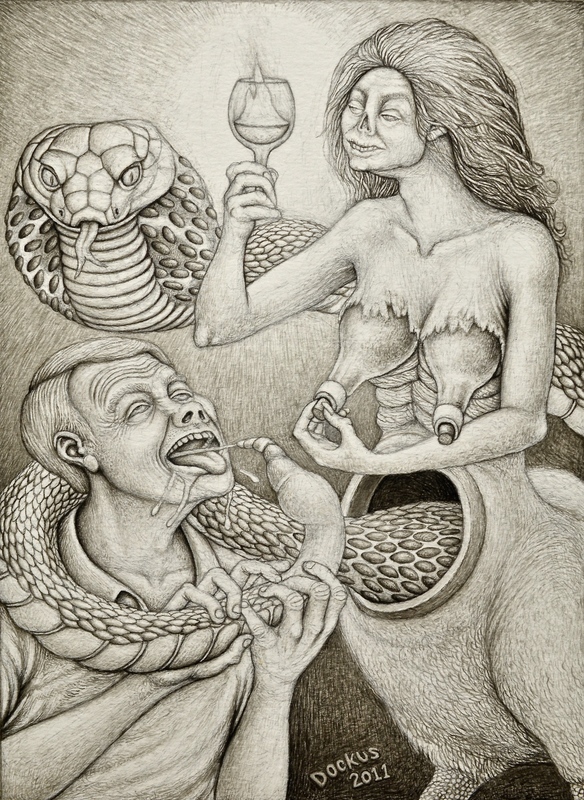 This entry was posted in art, graphite & ink, ink drawing and tagged addiction, alcoholism, Black magic, Father of Lies, monomania, Muse, outsider art, Void. Bookmark the permalink. This makes for an utterly harrowing read. You must be writing from experience, for no one — save he who has at some time fallen prey to it — can describe with such accuracy and visceral power the chaos alcohol is apt to wreak. Moreover, in your drawing, you have conveyed perfectly the mad and hopeless subservience of the Inebriate. As always, your mastery of word and image astounds and amazes. It is extremely rare for one to be in possession of both gifts. I wish I were able to furnish you with some constructive criticism, but alas, no such criticism dares to come forth. Your own praise for our work at The Colossus — we are a two-man venture, as you may or may not have noticed — is, on balance, so wonderfully laudatory that I sometimes question its seriousness. We truly appreciate it. I have realised that the writer-activist must abandon all flourishes and curlicues; he must value substance over style every time; he must pack away the ego and leave it behind. Thus far, I have failed abjectly in all of this, and I feel nothing but faint embarrassment upon reading guilty passages. From now on, my writing shall serve its subject matter rather than its author’s vanity. Of course, I hope you continue to read it. You are correct that I made this image and wrote the accompanying words from my own experience of alcohol in my private life, and as a witness of those I love having their less than honorable traits brought out under its influence. I myself go through cycles. I’m not a fall down drunk, but in my family drinking is insidious. I believe genetics play a significant part in the disease. I’m definitely at my best – a better human being – when I’m sober. Alcohol lubricates and warms social interaction. It can be especially tempting to writers and artists as an aid for getting to the other side of creative blocks. It loosens one up inside, softens contours, aIlows one to submerge and dwell atmospherically in problems. I’m not deluded and know I shall be tempted again. The poet in me always hankers after intoxication. Alcohol is just a cheap means of achieving it. As you guys must know from your own work, through your own joint endeavor, sometimes one may experience after hard work which finally leads one to a break-through, from passages which finally come out right, another kind of intoxication, a deep and abiding joy which doesn’t end in a hangover but rather causes one to open and blossom with self-awareness like a flower. Your incredibly generous and encouraging compliment of my talent for both writing and image-making, coming from two I respect and admire mutually from what I have so far read and understand of your intentions, has gone straight to my heart. I sincerely thank you. I don’t know you guys in person but in this spirit of creativity and intelligent inquiry and expression we share, I regard you increasingly in friendship. Wow, John. Is this really you? I have only seen you at your most self-depriving, soberness. It is hard to empathize with the misery of alcoholism when, like me, allergy to the stuff dulls its appeal – I vomit long before I can get any desensitizing pleasure, and I have never been obliviously drunk. A drunk to the likes of us is just a bore or a clown. This illustrated essay exposes the misery and suffering which we cannot sense. Unfortunately, thanks to the deliciously, if disgustingly, phallic tail, I will never again be able to enjoy a pigskin wine bag. Dear Tailessmonkey: The figure in this image isn’t strictly I; it’s more symbolic but still identified with and deeply felt. Hurt and anger also fueled its development. I wouldn’t deny it’s something of a self-portrait, but it’s not only that. I also see others I know in the figure, and not necessarily by facial features but by the figure’s position and expression. As an artist I hope to avoid moralizing and preaching, instead trying to breathe life into symbols and to animate them in a way that they correspond to living reality or resonate with some aspect of inner life, to make the invisible visible. I don’t think I’m up to the task most of the time. I’m delighted by the pigskin wine bag association you’ve brought to my attention. The association is indeed there and I didn’t even realize it. Poetry has a way of conferring a power on us not our own, summoning things in us we weren’t fully conscious are there, uniting us through mystery and transcendence. Thank you for your response!